100% Jio cashback vouchers worth Rs.400. Online shopping vouchers up to Rs.1899. Cashback on select E-wallet up to Rs.300 on every recharge of Rs.399 or above plan. 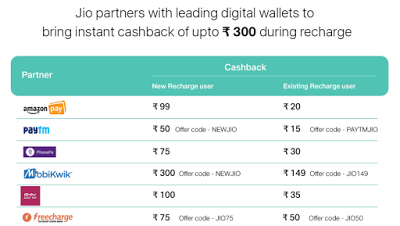 Jio partners with leading digital wallets to bring cashback of up to Rs.300 during recharge. In Amazon pay new recharge user will get Rs.99 & Existing recharge user will get Rs.20. In Paytm new recharge user will get Rs.50 (Offer code — NEWJIO) & Existing recharge user will get Rs.15 (Offer code — PAYTMJIO). In PhonePe new recharge, the user will get Rs.75 & Existing recharge user will get Rs.30. In MobiKwik new recharge user will get Rs.300 (Offer code — NEWJIO) & Existing recharge user will get Rs.149 (Offer code — JIO149). In Bhim Axis Pay new recharge user will get Rs.100 & Existing recharge user will get Rs.35. In Freecharge new recharge user will get Rs.75 (Offer code — JIO75) & Existing recharge user will get Rs.50 (Offer code — JIO50). Jio partners with leading e-commerce players to bring vouchers of up to Rs.1899 on every recharge. Yatra offers Rs.1000 off on roundtrip and Rs.500 off on one way on. Ajio.com offers Rs.399 off on apparels on a minimum purchase of Rs.1500. Trends offers Rs.500 off on a minimum purchase of Rs.1999.